Electronic reusable paper could reduce waste; as many as 40% of paper copies in offices are used for only a single day. Xerox is still looking for the perfect palimpsest, which is the word scholars use to describe a piece of writing material that has been erased and used again. The word "palimpsest" comes from two Greek root words meaning "scraped again." 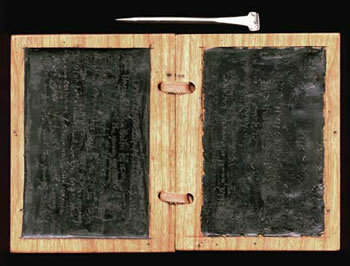 The Romans (experienced managers that they were) actually came up with tablets that could be reused. They were made of wood, and covered with wax. Writing was done with a pointed instrument; a straight-edged instrument was used in a razor-like fashion to re-smooth the surface for another use. We get the expression "clean slate" from the Latin tabula rasa, although as you can see above, traces remain of earlier writing. 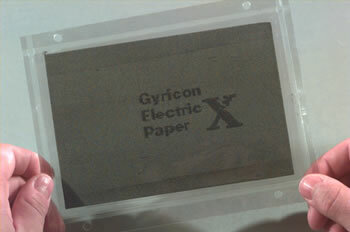 Xerox PARC has already come up with one product that fits the bill (and is somewhat more technologically advanced): Gyricon, which uses a thin layer of transparent plastic composed of small beads. 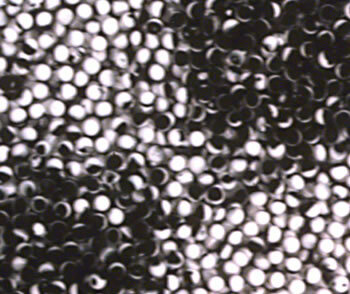 The beads have a light side and a dark side; when a voltage is applied to the bichromal beads at particular places on the sheet, the beads rotate to create an image. The Sony Reader was introduced earlier this year; it uses this technology in a continuously-refreshable form as an electronic book. Read Xerox Seeks Erasable Form of Paper for Copiers; via /. ; check out the Sony reader with e-paper screen. Tired of waiting for the perfect E-Palimpsest? Try making your own waxed tablet with instructions by Randy Asplund, sf and fantasy illustrator.